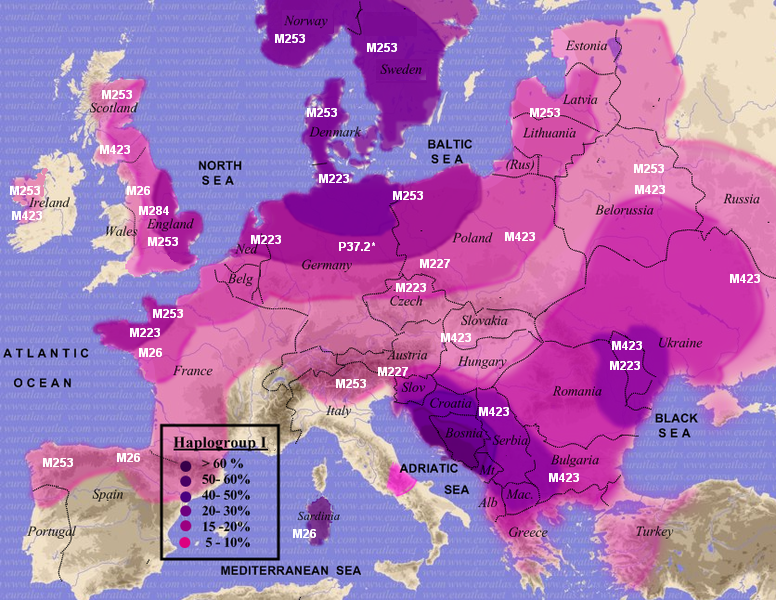 Haplogroup I is found almost exclusively in Europe where it is represented in about 20% of the population, making it the second most common haplogroup in western Europe, after R1b. Overall, Hg I has a broad European distribution, from the British Isles east to the Ural Mountains of Russia and south to Anatolia and the Mediterranean Sea. Hg I is divided into two main subclades: I1, which is the most common form of Hg I in northwestern Europe, and I2, which is the most common form of Hg I in southeastern Europe. Geographically, I1 is highly concentrated in northern Germany, Denmark, and southern Norway and Sweden. Y-DNA-HAPLOGROUP-I mailing list at RootsWeb.com. Labels in white are the SNP mutations; percentages are the frequency of Haplogroup I in the population. SNPs that appear on the map, but not in the chart at the left, are Haplogroup I2 SNPs. Hopefully, the map will be updated to include newer SNPs, such as L338. So far, four members of the project are Hg I1, representing three clades and four families. #184551 does not match another descendant of William BIDDLE, who is Haplogroup I2b2 (see Hg I2). People in different haplogroups cannot have had a common ancestor for thousands of years. He does have a 65/67 match with a member of the LETT project, so I'm afraid it appears #184551 has an NPE in his patrilineal line. The testing of cousins can uncover where in his line this NPE occurred. The positive result for M253 proves he is Hg I1. The negative results rule out subclades I1a thru I1e. This individual was tested at Oxford Ancestors. Ten markers are rather slim for predicting a haplogroup and cluster — or for determining significant matches — so your project admin recommends being retested at FTDNA. #114471 has no matches in the FTDNA database (as of 12 Mar 2014). #E5219 has only distant matches (up to 60/67), all in other surnames (as of 12 Mar 2014).